The Omega Speedmaster is an iconic watch, and its aesthetic is well known. The black dial with contrasting white markings and hands. The distinctive case profile with those twisted “lyre” lugs. That domed crystal rising above the inky, black tachymeter bezel. 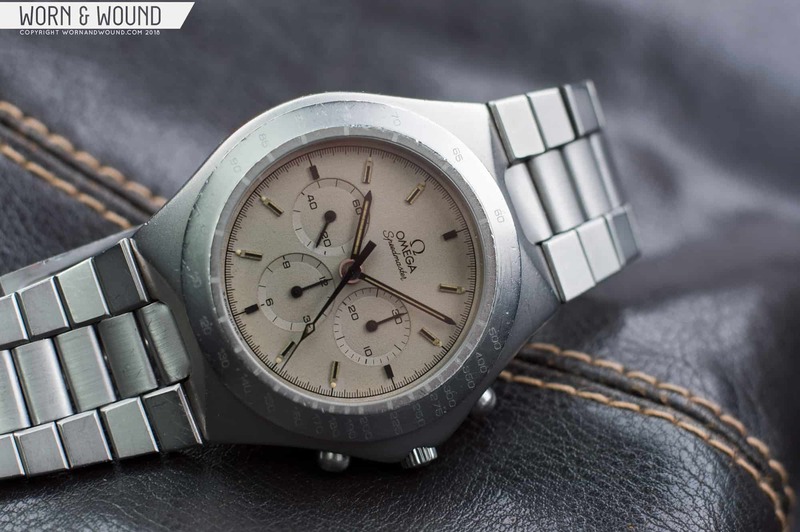 Well, today we’re going to look at a Speedmaster that breaks out of this mold. The Teutonic Speedmasters are a breed of their own—a collection of watches defined by their case shape, but in terms of dial and movement are pure Speedmaster. Intended for the German market, hence the playful “Teutonic” moniker, these watches were made in the early 1980s. It’s not quite clear what it was about that time and place that gave rise to such a wholesale change to a large chunk of the Speedmaster’s defining characteristics, but the result is interesting—a word I use deliberately. Get ready to love it or hate it. I fully expect the Teutonic to provoke a wide range of reactions. What is clearly a Speedmaster at its heart has an overall exterior feel so far removed that it creates a dichotomy that is resolved by an individual as either a harmonious and balanced relationship, or as an ugly mess. There are five different watches that make up the Tuetonic range. (1) Black and (2) gray dials in a stainless steel case, (3) black and (4) two-tone dials in a two-tone case, and the (5) Mark V, which uses a slightly different case due to the thicker 1045 automatic caliber—Omega’s version of the iconic Lemania 5100 central-minutes chronograph movement. The other four Teutonic Speedmasters all share a reference from Omega—145.0040. The one that we’ll be looking at today is the gray-dial variant in a blasted steel case. Let’s start with the obvious—the case. Asymmetrical, bulbous, and slightly organic, the case silhouette and integrated bracelet are two of the defining features of this watch. The bezel measures 39 millimeters in diameter, but with the case splaying out on the three o’clock side towards the pushers and crown it stretches to 44 millimeters across. The lug-to-lug length is only 46 millimeters, so despite taking slightly more wrist real estate than a regular Speedmaster, the Teutonic wears smaller and more comfortably than you might think at first glance. The integrated bracelet is integral to the Teutonic design. The case edges and lines are mostly soft and flowing, and the bead-blasted finish adds to this effect. The chronograph pushers and crown are rounded and deeply set within the case, and though the case lines threaten to resolve to a sharp point against the back of your hand, the angles soften again to create a gentle recess. The protrusion of the case on the right side is offset and echoed by the concave scallop at the top and bottom lugs where the integrated bracelet meets the case. The bracelet itself is fairly lightweight, but the flat links and pronounced taper match the aesthetics of the watch perfectly. The three-link design gives off a sporty and unmistakably ’80s vibe, and, due to the lug design, it’s visible on both sides of the wrist when the watch is viewed face on. From other angles, the line of the bracelet continues up into the scalloped areas of the case. Of course, the integrated bracelet does mean that other strap choices are a non-starter, but this isn’t a watch where I wouldn’t even think about swapping out the bracelet. The transition from case to bracelet is an integral part of the design. As with other Speedmasters, the bezel here displays a tachymeter ring. Instead of an insert, the markings are etched into the steel bezel itself, and on a more pristine example they’d be filled with paint to make them much more legible. The scratched bezel here suggests this watch has spent much of its life as a true tool. The crystal is a flat sapphire unlike most other Speedmaster references, and that choice over acrylic has allowed the crystal to withstand the test of time a little better than the case and bezel have. So, in what ways is it similar to the totemic Speedmaster? Let us turn to the dial and movement. Inside beats the Omega 861—a manual caliber that is well known to Speedmaster fans. The Omega 861 gives rise to the familiar chronograph dial layout with running seconds at the nine o’clock register, and with chronograph minutes and hours at three and six o’clock, respectively. The sandpaper-like finish to the dial gives it great texture and detail, and the applied indices create depth. The indices at three, six, nine and 12 are solid black, whereas the others exhibit a more ornate design with a gold and black finish. The gold adds a slight warmth against the gray of the dial and case, and it’s also matched by the lumed areas of the hands and hour markers. The lume itself is long past useful here, and the luminous paint on the tip of the second hand has flaked and fallen away. This is probably the largest cosmetic disappointment on my example, and though it can be rectified, I prefer to leave it as is rather than have a newly lumed second hand looking out of place. Like many watches of its age, the market price is highly dependent on condition. I generally see these watches go for a range of anywhere between $2,000 and $3,000, so on paper the Teutonic appears to be one of the best value Omega Speedmasters you can buy outside of the Reduced range—of course, that’s if you can see the beauty in it.